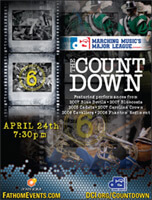 Drum Corps International's spring cinema event, "The Countdown" comes to more than 300 theaters across the United States for only one night on Thursday, April 24. A downloadable poster is now available to print and post in your band room, dorm room, office, or wherever you want friends to know about "The Countdown." Also available are promotional Web banners perfect for your Web site, blog, MySpace or Facebook profiles. Purchase tickets to "The Countdown" through FathomEvents.com.